LOGAN — A Utah State police officer was hospitalized after being hit by a car Thursday afternoon. The officer was directing traffic along US-89, near 1200 East in Logan. 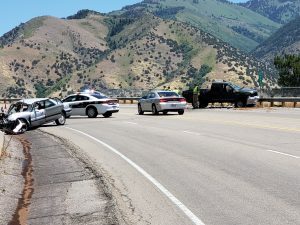 Utah Highway Patrol trooper Phil Rawlinson said two officers were diverting traffic away from another accident, when a woman struck one of the patrolmen with a Honda minivan. “Another officer waived her through, so she went,” Rawlinson explained. “As she was going through the intersection, she looked to her right to make sure it was clear to continue. When she turned around, the other officer was right in front of her, and coming up over her hood at that point. Paramedics transported the officer to Logan Regional Hospital. USU media relations director Eric Warren said the officer was in stable condition. He was released several hours later. Rawlinson said luckily the van was only traveling around 15 mph when it hit the officer. Traffic at the time was being diverted from an earlier accident that occurred further west, near 800 East US-89. Logan City Police Lt. Brett Randell said a F-250 pickup truck was driving westbound when it crossed the median and eastbound lane, striking a Buick head-on. Paramedics transported the 43-year-old man to Logan Regional Hospital. The 65-year-old driver of the Buick had to be extricated from his car. He was also transported to Logan Regional Hospital with minor injuries. Randell said investigators suspect the driver of the truck was under under the influence of methamphetamine at the time of the crash. They have taken blood tests and are awaiting the results, before issuing any charges. US-89 was closed from 1600 East to 600 East for about 80 minutes, while both accidents were investigated and cleaned up.